Unless you have unlimited time on your hands your garden will likely succumb to weeds on many occasions. In a matter of days they can take over, especially after a lot of rain. If you’re enjoying summer, you might end up going weeks without weeding. You’ll likely start to get discouraged by the daunting task of weeding plants that are strongly rooted. 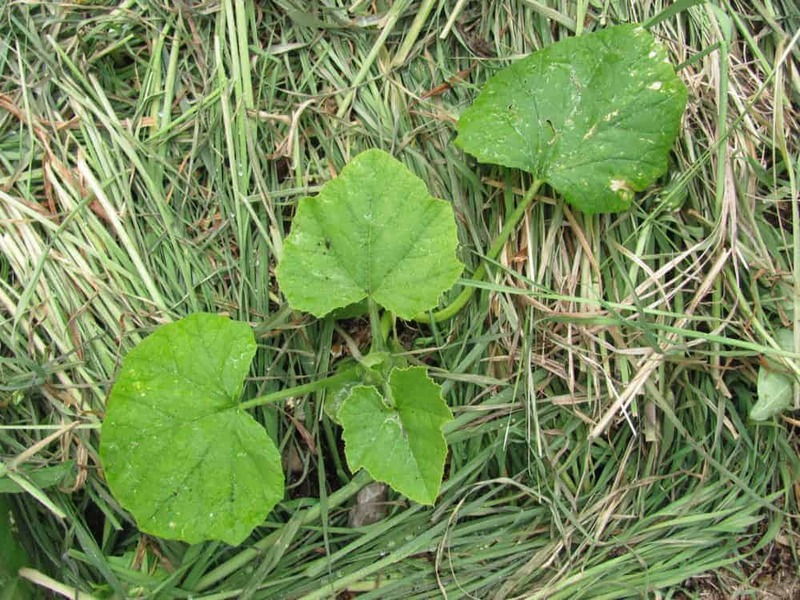 There are many ways to get rid of garden weeds naturally. Why is this important? Because if you have plants like tomatoes that are surrounded in a thicket of weeds you probably want (and can) save them so you still get harvests. 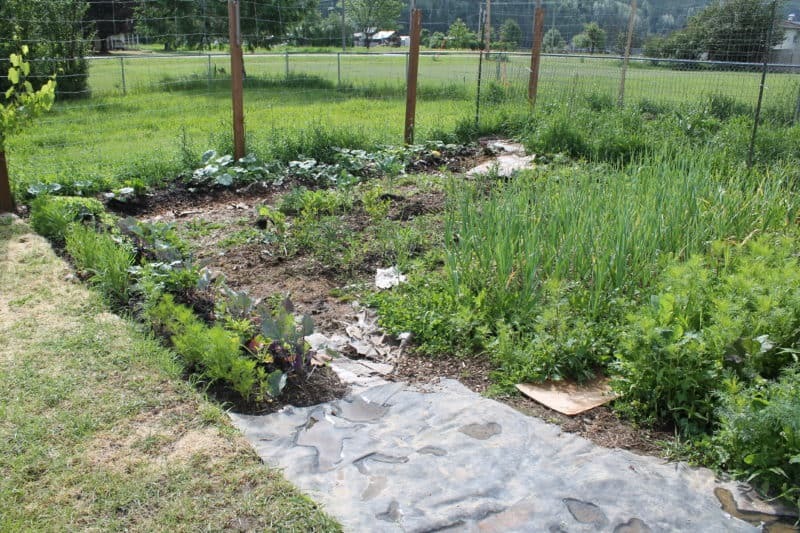 Other times the plants that you’re growing might be so surrounded by weeds to the point it’s almost impossible not to accidentally damage the crops or flowers. You need to know if you can kill or remove the whole area or if you can’t. What you’d like to do with that area. 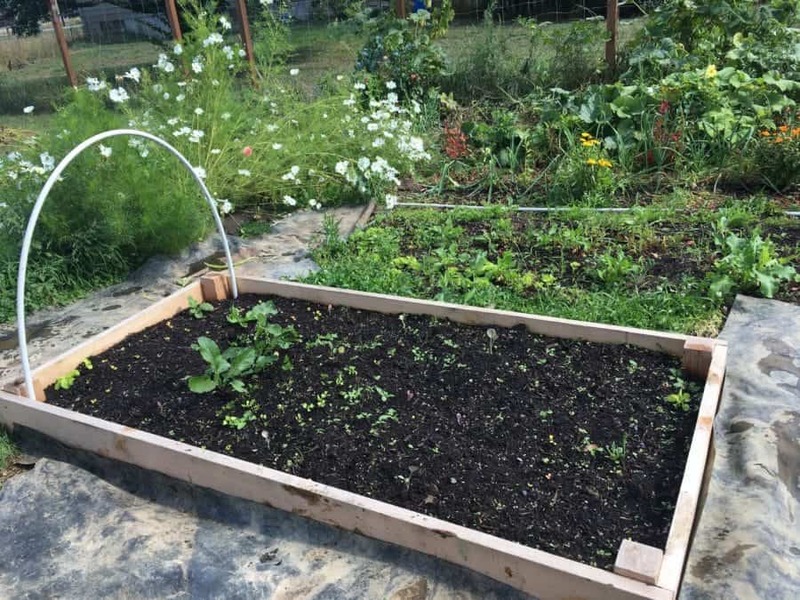 Are you building raised beds? Trying to save the soil below? Are the weeds tall and have gone to seed? If they have there’s likely a lot of weed seeds underneath. They’ll keep germinating increasing the weeds in your garden bed. Are the weeds in the garden beds or in the pathways? Will gardening tools do the trick? Can you smother the weeds and build above? Do you have crops, plants or bushes growing that you need to keep alive? 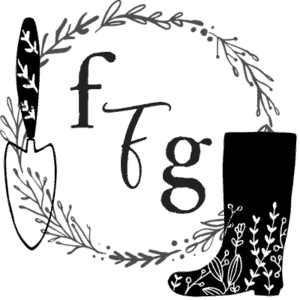 Do you have flat ground where tilling would work? Or do you have lots of uneven ground and rocks underneath? I’ll also cover some preventive measures and ways you can smother weeds to build on top of the previous weeds. I don’t cover using chemicals to remove your weeds because I strongly disagree with using chemicals to ‘kill’ weeds. 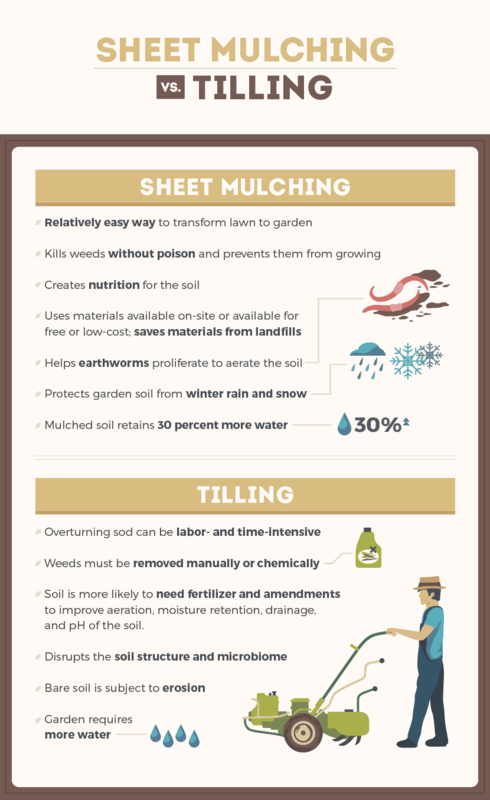 Adding chemicals into your backyard and especially vegetable garden is terrible for your soil and health. If you really don’t want to deal with large areas of weeds, you could cover them in large thick black plastic weed barrier to block out the light. If you have crops that you’d like to save, removing weeds by hand is necessary. Even though weeding by hand isn’t always enjoyable, truth is sometimes you have to as that’s the majority of good old-fashioned gardening work. It also depends on your finances. Above you can see us hand-digging out grass squares to put in our new garden. It would of been much nicer to pay someone to dig it out with a tractor but it also adds to the cost. Easier still would have been to place black landscape fabric and build a garden above the grass. Below you can see the weeds in our greenhouse when we moved to our new acreage. They were over 5 feet tall but because they hadn’t been watered in months they pulled out easier than I thought they would. Sometimes using your hands to pull out weeds then hoeing is the best option. We were going to let the chickens in their for a few months but it was heading into winter and we didn’t have our flock yet. After allowing the weeds to germinate and pulling them up again I decided to mulch to reduce any further weeds from coming up. A good garden hoe is essential for removing weeds. Everyone has a preference in what feels right for a good hoe, I’ve met farmers who prefer the flat wide ones, some like the sharper ones. 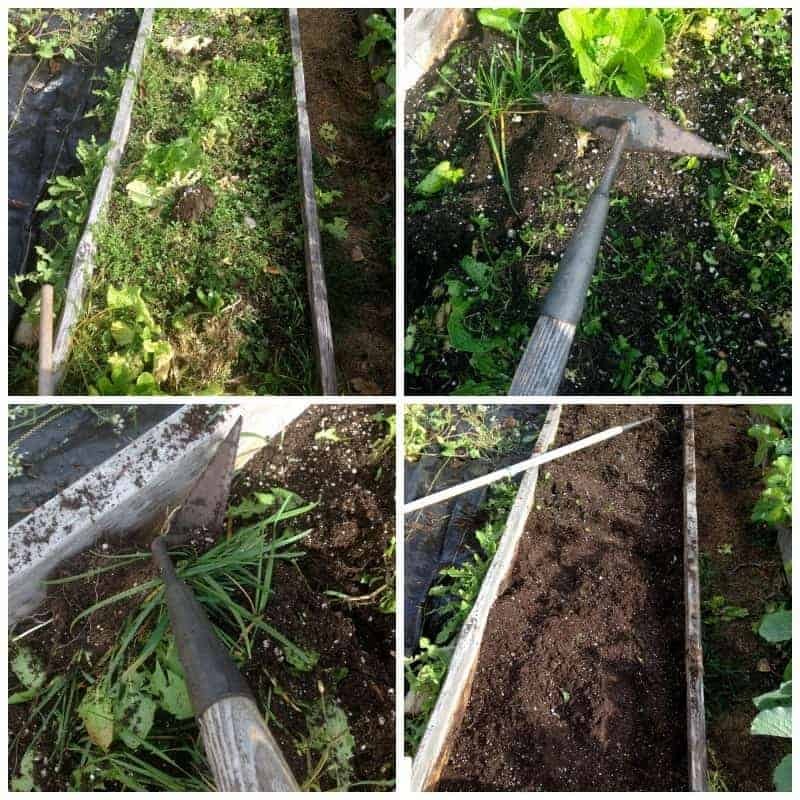 My favourite is the diamond shaped hoe, I love that I can hack down at the weed roots with the sharp diamond corners as well as get the smaller weed seedlings by reducing the width of surface area I’m hoeing down. 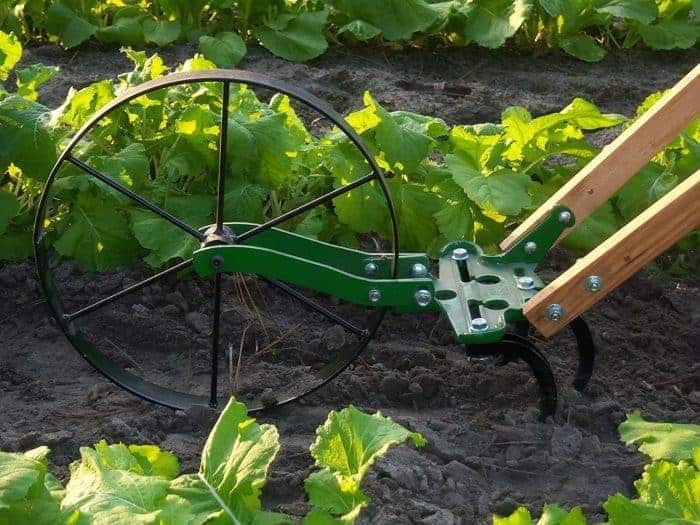 Now that we have flat land with long rows I’ll likely invest in a wheel hoe. What tools work for weeding really depends on the size and shape of your garden beds. You can also get smaller hand sized hoes (affiliate link) for getting in-between smaller rows. 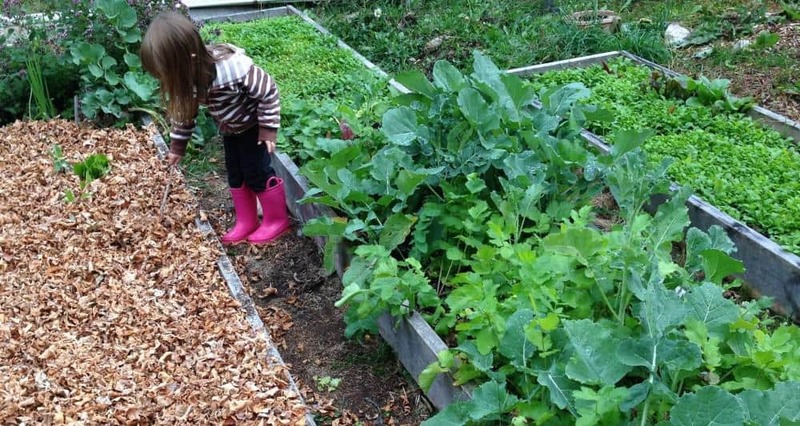 The smaller ones work better in raised beds where you’re weeding close to your vegetables. I also use a ‘dandelion remover’ tool (affiliate link) which also works great with deep taproot weeds although burdock has proven too large. It’s also great for those prickly weeds you don’t want to go close! Chickens are fantastic for scraping up the ground and weeding. 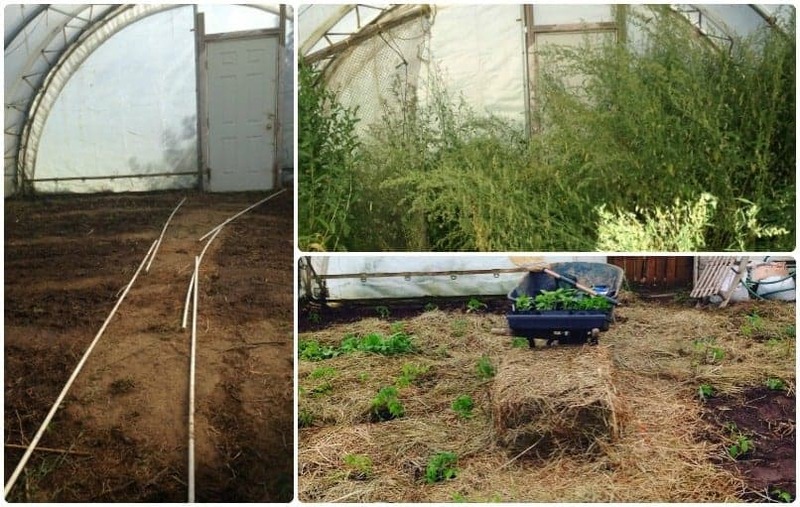 You won’t be able to use them in your garden beds, but you could cover each bed using pvc pipes and chicken wire and let them free range everywhere else. They are great to throw in the garden in the fall or off-season to clear everything up, we did that last year with our hens and they did an excellent job. I’ve really thought about chicken proofing beds that don’t need regular harvesting (like long season plants such as parsnips, carrots, onions, garlic, dried beans etc) then fencing off the rest of the garden for chicken free zone. 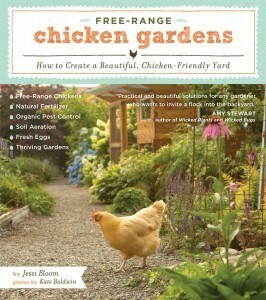 I’ve been thoroughly enjoying this book on incorporating chickens into the garden. Here are some tips for free-ranging your chickens safely in your garden. You can also do what we did & build rotational chicken runs around your garden. I’ve yet to try the vinegar or hot water method. 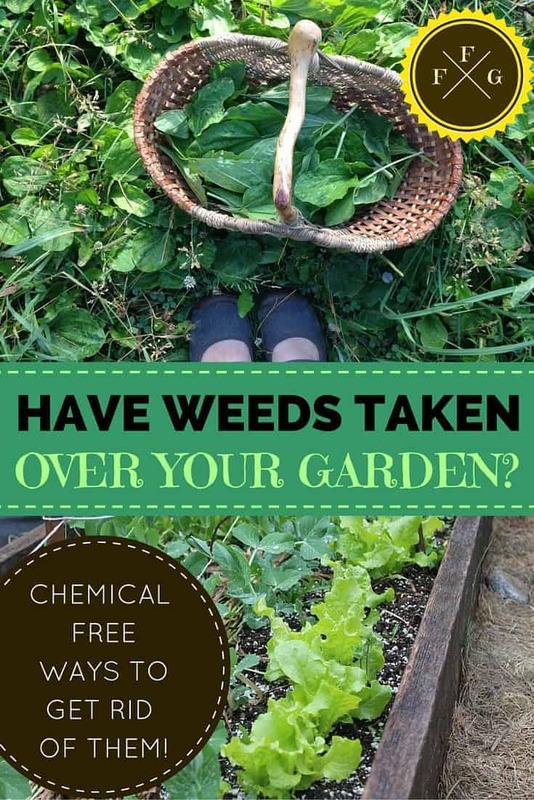 This option is supposed to kill the weeds without using herbicides or pesticides which only add harmful chemicals into your garden (& thus your body). I’ve heard that it works great, although I do wonder about the acidity of the vinegar affecting soil ph. The hot water method is great if you have left over canning bath water. For real!!!! The first time I volunteered at a local farm, they used a blow torch along with hoeing to keep weeds in control. I was a little surprised, and haven’t tried this but be advised to use caution if using this method for weed control. Obviously you can’t do this during peak summer or drought scenarios due to fire risk. Read more on how to use a blow torch for killing weeds here. You can see the red dragon torch here (affiliate link). I’m going to be brief with this method and say you can till with either a gas-powered tiller or the old-fashioned kind (if you don’t have rocky terrain like ours) but I personally don’t recommend it. You disrupt and kill most of the microorganisms so beneficial to your soil structure which is not good for long-term healthy soil. The till or no till is a big heated debate among gardeners and farmers as it’s been the easiest way to clear large areas of land. (Read a debate here). However if you have large areas it does the trick, especially if this is your first year gardening and you want to put in a garden quickly. You can smother weeds out with plastic weed barrier or use cardboard to build on top of your weeds. 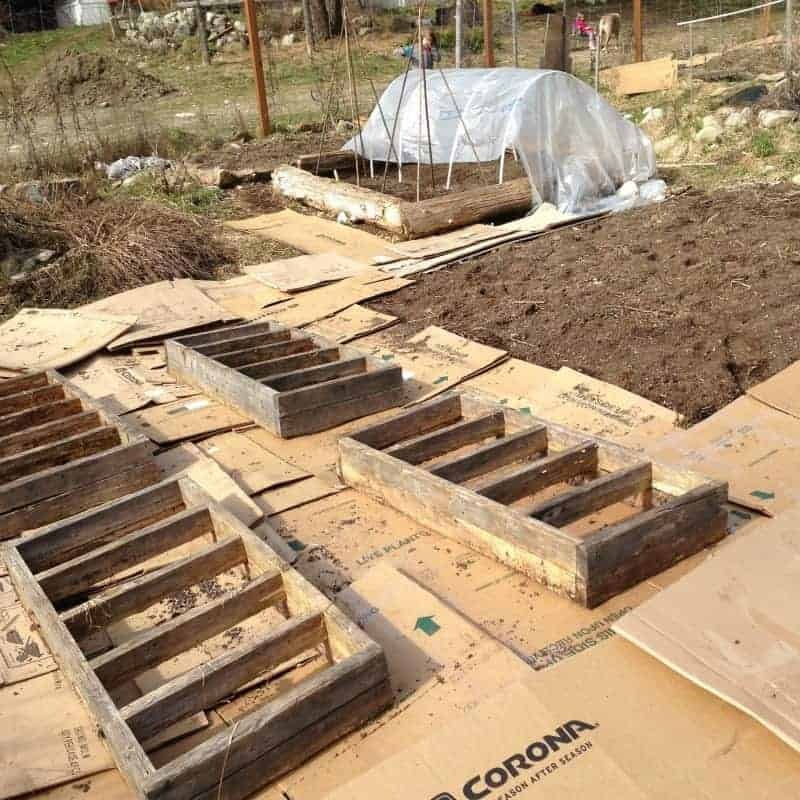 This is great if you plan on building raised beds for example and have flat land. This is my favorite method with large areas of weeds, smother them and build something new. In fact, I often look at corners of the garden that are full with many weeds and go ‘meh, I’m not going to bother weeding that area, I’ll just throw some cardboard down and build a new bed next season. You can only do this if your weeds are shorter, if they are super tall this won’t work as well until the spring. Above you can see a garden bed we made with the Lasagna gardening method. 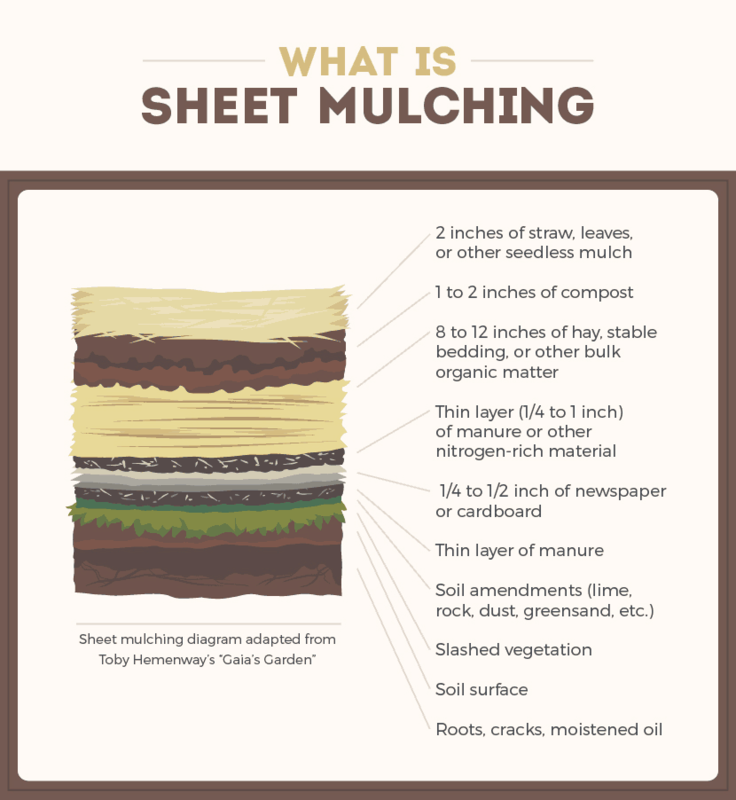 Sheet mulching, or lasagna gardening, involves layering cardboard, soil, straw, compost, manure, etc into layers until you have ‘built up’ and created a new bed. Hugelkultur beds are old or rotten logs that are stacked upwards and can hold water and decompose slowly releasing nutrients into the soil. They are neat because you can plant on both sides because of the height. 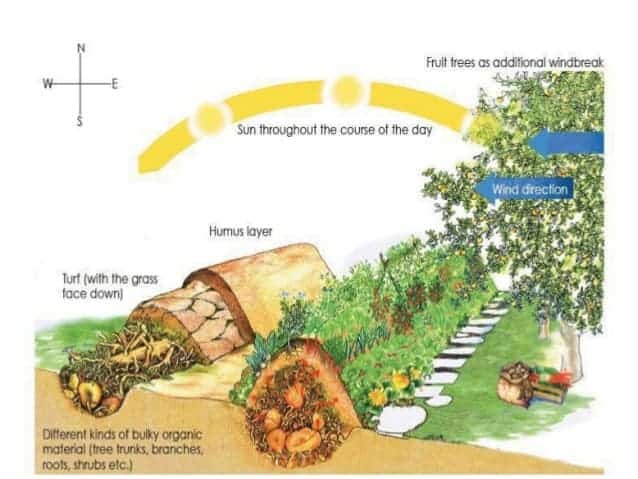 For full details on how to build a hugelkultur bed check out this link. Read more about Hugelkultur here & here. This post wouldn’t be complete without some preventive measures right? I’ve become a huge fan of mulching garden paths to prevent weeds. Every year that we use wood chips in our garden paths the weeds are significantly reduced, although I’ve found it only lasts a couple of years. Other mulches are straw, newspapers, I often use cardboard in areas for short term weed reduction. 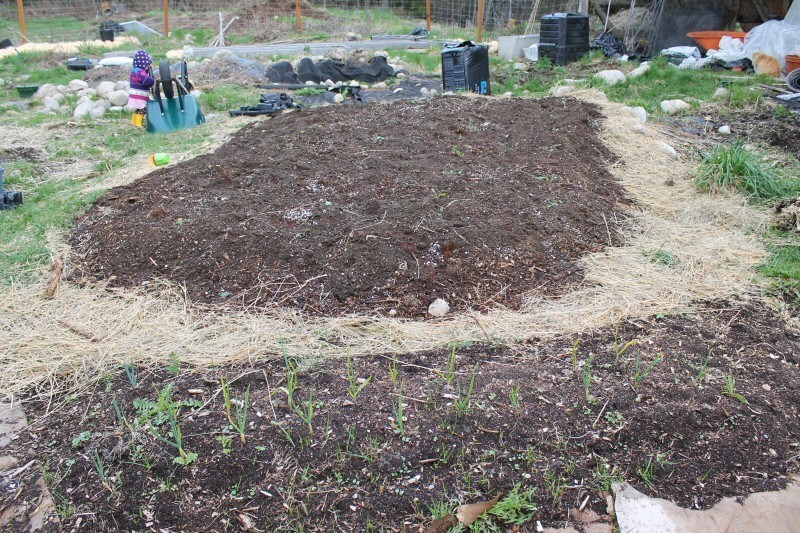 I’ve tried different mulches, you can read my review of straw vs hay vs woodchips. It goes without saying that if you weed often and before anything goes to seed your weed situation will be far better. So long as they haven’t gone to seed, you can compost the green parts of any weed as the ‘green material’ in your compost. I’ve started using weeds like grass, large burdock leaves or dandelion greens as mulches in-between rows. They’re FREE and add some nitrogen back into the soil. Once again though, just make sure nothing has gone to seed and it’s not like grassroots which spread underneath and on top. It can help to observe different types of weeds and their life cycle in the garden. You’ll likely notice that weeds are easier to remove in certain ‘target window’ times. Grass is always easier dug out in the spring than the fall. 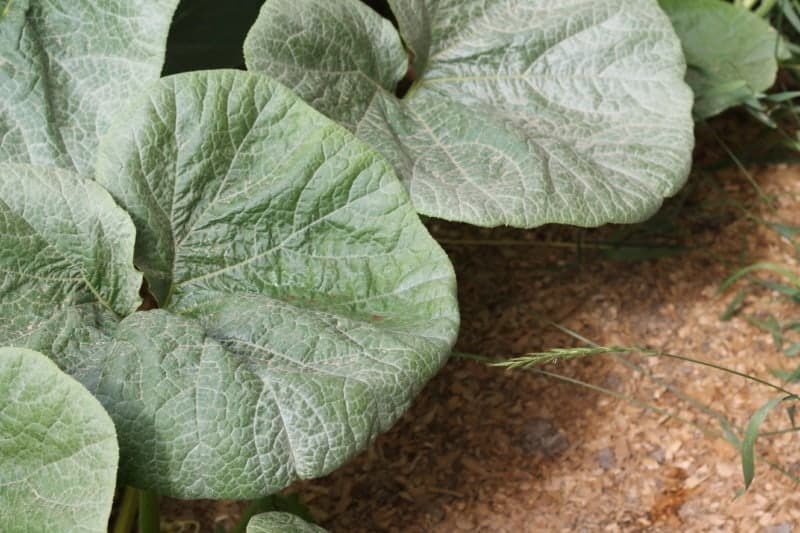 Burdock is a challenge as it has a two-year cycle. 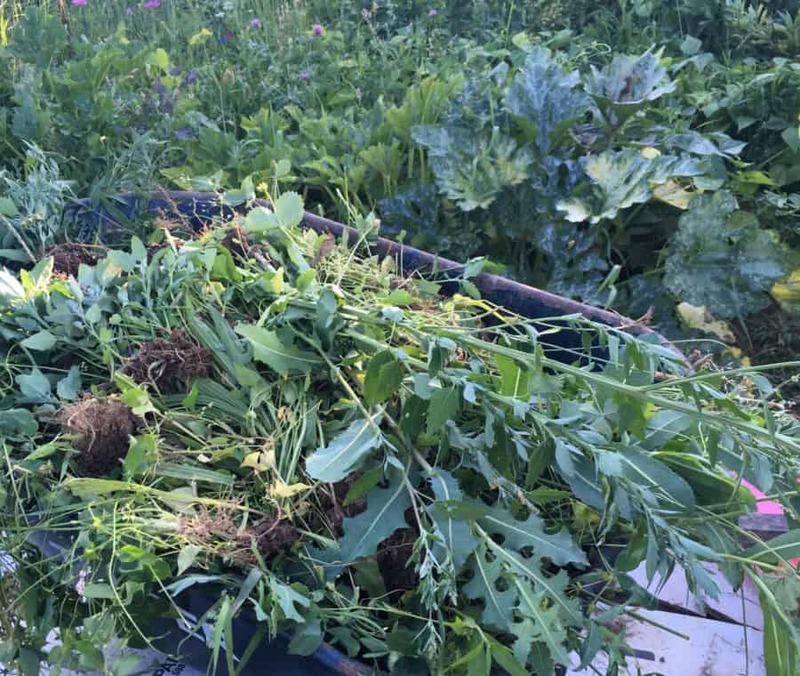 Even though you always want to remove weeds before they go to seed, some plants, like burdock, actually get stronger if you try and remove them too early (kudos to mother nature!). I’ve found that if I cut them down right before it sets seed not too early in the season, I can pull up the root the following spring much easier. The more you know about your weeds the better you can battle them. The idea behind cover crops is that not only are you suppressing weeds from growing in between growing seasons but you’re also adding nutrients back into the soil. Above you can see a mustard green cover crop, which you can eat too! 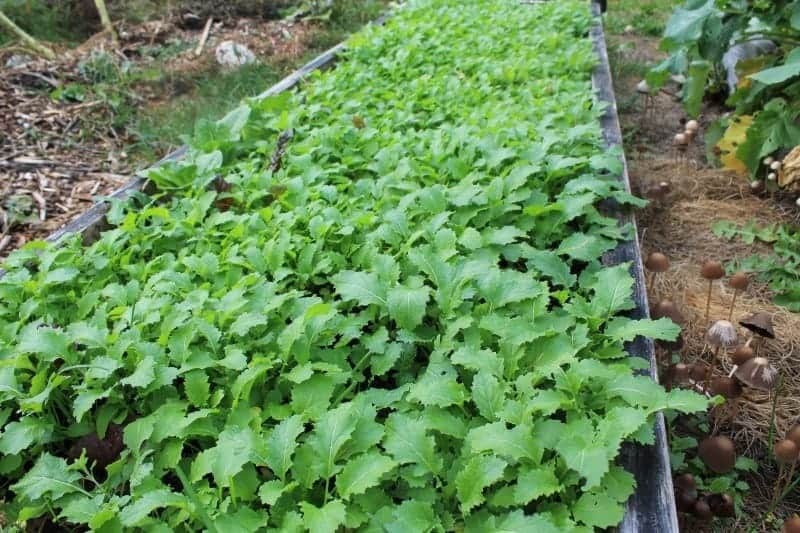 For a guide to how to grow cover crops check out this article from West Coast Seeds. 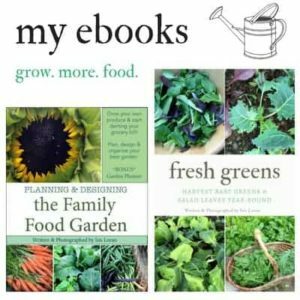 Next year I really want to try growing Buckwheat after reading ‘9 Reasons Buckwheat belongs in your Garden’ from Attainable Sustainable. Select your weed battles based on edibility. You’d be AMAZED at how many weeds are not only edible but also super nutritious (Read ‘Weeds are Good For You!’ by This Organic Life). Dehydrated wild nettle (which is super high in iron, calcium, minerals etc) at our local health food store for example is $7.99/100g!! I’ve learned to leave large patches of it in the garden, sort of like a healthy perennial patch, until I can build new beds. I also leave plantain, dandelions (in most places), chicory and lambs quarters. You can make a green super powder with weeds as Joybilee Farm does! You can then use the oil to make ‘Dandelion Salve’ like the Montana Homesteader did or Dandelion Lotion Bars like the Nerdy Farm Wife. You can even make Wild Nettle Beer or Dandelion Wine. Check out some burdock recipes here. 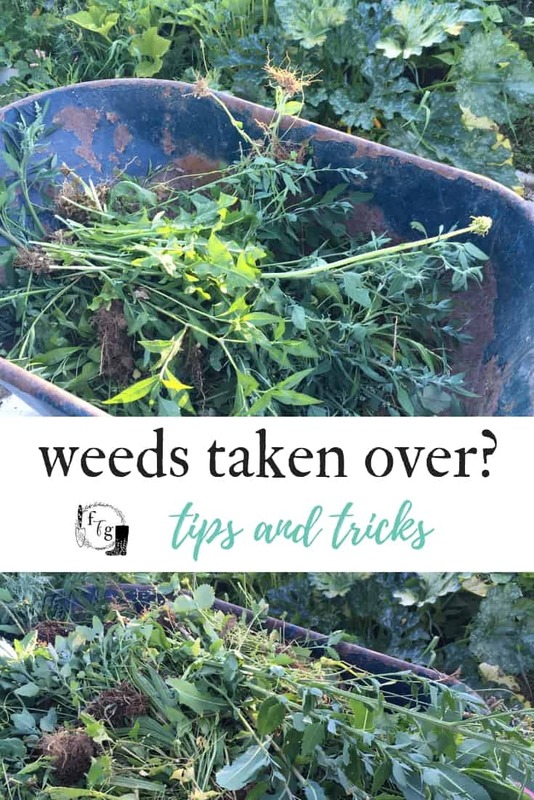 Although there are beneficial weeds, be careful to not let them take over as if they go to seed this will happen quickly. *Make sure none of the weeds are poisonous to livestock. You don’t want to cause liver toxicity and death rapidly in livestock. Dealing with weeds is part of gardening. Over time you’ll learn the best ways to prevent or get rid of weeds in your location. I put wood chips in a gardend box. 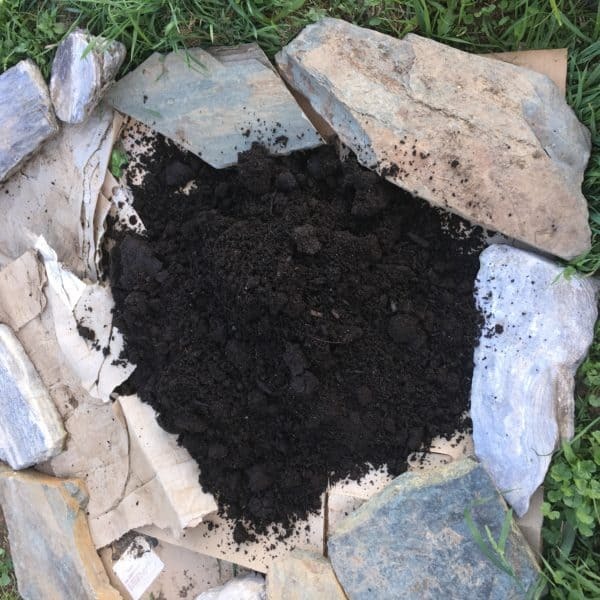 I mixed it with top soil. I hope I did not do the wrong thing. I plan on putting more top soil in the box. I’m wondering if this will be all right.? Last year my garden was 99% weeds 1% vegetables! I’d been tilling it in the spring for two years and have now decided to try a no-till method. I covered the whole thing in old alfalfa hay and am waiting to see what’s going to happen this season. I’m also putting in specific pathways with a huge layer of hay or straw to minimize the area I need to weed even more. Another thing I’m going to try is simply planting more plants I want to be there so the weeds don’t have room to grow. Thanks for all your awesome tips, Isis! Best of luck with this gardening season Margaret! I found this while trying to figure out what to do with my front flower bed. When we first moved in it had gorgeous knock out roses and gardenia bushes, and daffodils that pop up in the spring. Now, due to our neglect and some major renovations inside that took all our time and money, the bushes are still there but they are soooo overgrown with weeds and ivy that I’m terrified of the job ahead of me. Your ideas seem wonderful, and I would love to smother all the weeds out.. but is there a way to smother the weeds without killing off my daffodils? Could I just go a lot lighter with the layers in the parts where I know there are bulbs? Thank you so much! Any help is appreciated! I don’t have much experience with ornamental gardens, mostly vegetable gardening. Rose bushes get pruned back every fall. Mulching the area with wood chips might help but I’m not sure how much coverage the bulbs can take; sorry I wish I was more help! My family and I are getting ready to make a huge transition in me leaving my full time job to stay at home and homestead on our 1 acre. We kind of jumped in head first and made a list of all the things we wanted to accomplish, and putting in a large vegetable garden was our #1 priority. After reading this article, particularly the tilling portion, I feel like we’ve messed up! We tilled the entire area that we want to plant, and now I feel the hugelkultur method would’ve been a much better option, as we are definitely leaning toward polyculture. We will be keeping bees come springtime, and I feel they would like this much better. Is there a way for us to “undo” the damage we’ve done to the soil by tilling? Hi we just bought a house and they let the yard get overrun with weeds for years and years. I want to be able to just plant flowers, bushes and creeper plants next spring. Would you recommend just laying down newspaper or cardboard over the winter? So happy that you have a new home! The cardboard or newspaper will decompose over the winter, the weed seeds will still be able to sprout in the spring or summer. I have far less experience with ornamental gardens but many people use landscaping fabric and mulch around the plants they’ve planted. You’ll need to keep adding mulch every couple of years. I hope that helps. Our garden has been overrun by weeds. I want to continue to grow my herbs and veggies, but it is becoming too difficult to keep up with the weeds. 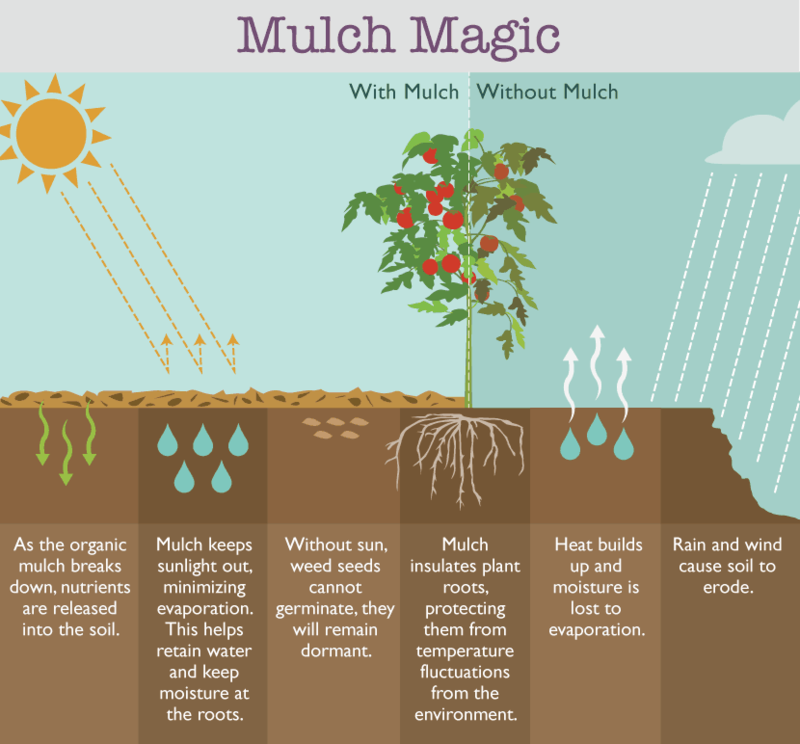 I never realized that mulching could prevent weeds in the first place. Next year, I’ll have to do that. This is a very informative and helpful article. Hi there! Thanks so much for this post!! I’m considering doing the lasagna method seeing as it seems the best for keeping the area I garden well-nourished. How do I go about planting my veggies after I’ve put down all of the layers? Do I need to wait a certain amount of time? Thanks so much! So long as the manure is fully decomposed you can plant in a lasagna bed right away. 🙂 The best plants for them aren’t root veggies, you want to grow something above ground because the layers need to decompose a bit for a season. 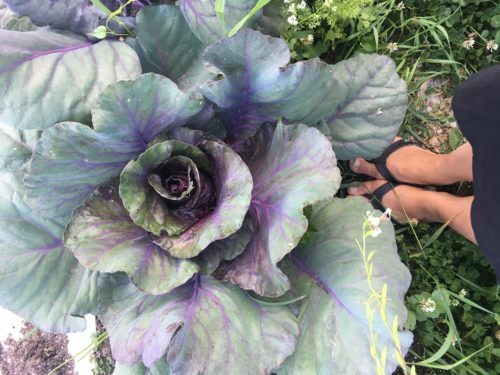 Lettuce, brassicas, squash, they’re all great to grow. 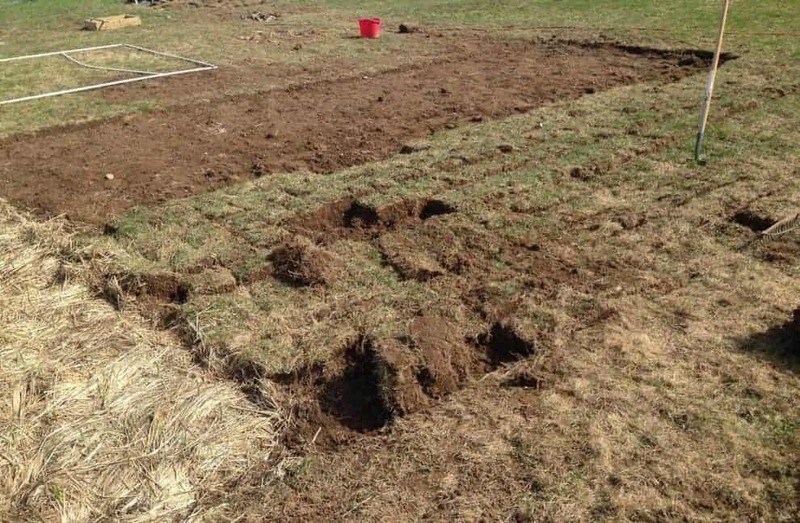 We have a patch of lawn we’re planting the 3 sisters guild (corn, beans and squash) in this year and will be making a new lasagna garden bed for. Happy gardening!